Append third row of text to a find replace? I have 1k+ files that I need to find foo in and make it foo&3rdrow. Least complex way to make this happen without hand massaging each file? Thanks! I’m trying to guess what you want, because a literal example would be welcomed ! are you expecting the following text ? If so, I will be able to post a solution, next time, which does the job, with two consecutive regex search/replacements ! I think your example has it correct, but hopefully the above illustrates the case a tad better. OK for the time stamp, in line 3 of your files, but you didn’t add what text you expect to, after replacement ! A : foo&1/1/2008 14:53:36 , with a literal & between ? B : foo1/1/2008 14:53:36 , simply attached ? C : foo 1/1/2008 14:53:36, with a space separator ? D : Other Case ? A space between would be perfect. 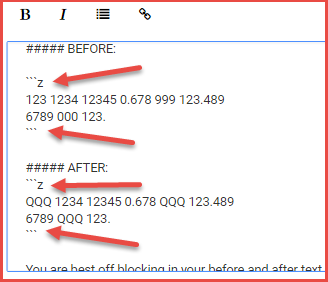 Note that it’s necessary to copy the time stamp line at the very end, because, once the regex engine position is after Line 3, looking for some foo occurrences, it cannot remember that specific line, because it’s not part, anymore, of the later matches ! If you want to, I’ll give you, next time, some explanations about these regexes !! If group 1 does not exist ( case of the second alternative ), the very last line, temporarily added, is then, simply, deleted, as no ELSE part is present in the conditional replacement ?1..... !